Okay, so now you’re pregnant. Congratulations! This is probably the most exciting event of your life . . . and maybe the most overwhelming. You know there’s a ton of stuff you’re supposed to do – and a ton of stuff you’re NOT supposed to do. And, as a mindful member of the world community, you know that this one takes ‘responsibility’ to a whole new level. So, where do you even start?! Oh why didn’t you pay closer attention when your sister/cousin/friend was pregnant? And what was that Yahoo news headline about babies and BPA? Damn, there’s a lot to cover! But don’t you worry, in this series of essays I’m going to address many of the main issues that arise while making – and managing – a ‘green’ baby. From the truth about cloth diapers, to DIY supplies, to why we made the radical and unexpected decision to actually vaccinate our son (no judgments, no worries). But for now let’s start at the very beginning, with the simple stuff. Having a baby is one of the most commercialized, consumption-centered events in existence. From the maternity clothes to the party planning to the safety gear – it’s traditionally a product-driven affair. Don’t believe me? Try Googling ‘newborn checklist’ for a laugh at the lengthy inventory that’s supposedly required to bring a baby into your home. Or just go browse Babies ‘R Us for a real fright. Eek! So in case you haven’t realized it yet (and I certainly didn’t at first), being a parent is all about making choices. An endless series of serious choices. Everyone chooses a different path in parenthood, and that’s as it should be. For me, a lifelong nonconformist, I suspected that my biggest divergence from the traditional route would be in my resolute lack of desire to acquire STUFF. I try to live lightly and that certainly wasn’t changing because of a baby. In fact, it strengthened my resolve to leave the littlest footprint possible. When I thought of living rooms littered with primary-colored plastic play sets, and all manner of pastel paraphernalia, it made my head spin. That is not for me! No, there had to be a way to avoid over-consumption . . . The first thing I did was some serious communication, and this is hands down the most important action you can take. Make a list of your criteria, then prioritize. Be prepared to compromise. A shower invitation with a small note that reads, “The parents-to-be would appreciate non-gendered toys and clothes in natural fibers”, is a lot friendlier than one that declares, “The parents-to-be would prefer only second hand items, non-gendered cotton clothing, no plastic or electronic toys, and please keep things exclusively organic”. It may be true, but it’s just not inviting! There’s many ways to subtly communicate your wishes. Enlist those who know you best to help spread the word (I’m thinking bffs, moms, and mother-in-laws here) It’s really easy to drop a hint in general conversation – “Oh man, I saw the cutest organic onesie from Company X. I think their entire line is organic . . . wouldn’t it be great if all the baby’s clothes were organic? So much better for their precious little skin, ya know?” And there you have it: message sent! The bottom line is, if it’s important to you (and I’m guessing it is), you’re going to have to communicate. *** Just an aside for vegans, you may need to gently remind folks of unsuitable items. This includes fibers like wool (very common in baby clothes and people think us crunchy types are all about it), toys which may include bits of fur, feathers, and leather, care products which commonly include beeswax and lanolin, and books or toys expressing animal exploitation, ie farm stuff. A lot of loved ones forget that veganism extends beyond diet. My awesome mother-in-law made sleepers out of my father-in-law’s old tee shirts! So know what essentials you’ll really need, write it down, and keep track. You don’t want to end up with 3 changing tables and no car seat! 1) You can get so many things used! In your Amazon profile, under your picture, is a spot for a quote or caption. In mine I wrote ‘please buy secondhand when possible’! Books, music, toys – your relatives can get lots of secondhand baby stuff and satisfy your eco-leanings. 2) The options on Amazon are astounding, and surprisingly progressive. BPA-free baby bottles? Check! Organic hemp wipes? You got it! You really will be able to meet all your greenest needs here. 3) Amazon is not just baby-centric. You probably already have an Amazon account, maybe even an Amazon wishlist. One of the main reasons I keep a registry/wishlist is to simply keep track of things, so they don’t slip my mind forever. I’ll hear some amazing interview with an author and quickly pop over and add the book to the list before I forget about it. Or I’ll remember some song I loved as a child, track down the CD, and add it to the registry for when Waits is older (can’t wait!!!) It’s super handy when you’re already juggling 5 million things with breastfeeding brain fog on top of it all. 4) The ‘universal registry’. This is a spectacular feature that allows you to add pretty much anything on the entire internet. That’s how my wishlist is full of Herbivore stuff, and that’s how *your* baby registry could be filled with one-of-a-kind handmade Etsy toys, or whatever else your heart desires. Awesome, awesome feature. Bonzai reader Jacquelyn sent us these beautiful handmade bibs and burp rags! So once you’ve whittled down your wants, you’ve expressed your quirky hippie desires to all the baffled elders, and you’ve helped them out by building a badass registry full of eco-friendly options, there’s only one piece of advice left: Be Thankful. You WILL get stuff you don’t want. The vegan WILL get wool, the BPA-paranoid WILL get freaky cheap made-in-China teethers, and team gender-neutral will get TONS of frilly pink dresses. And it’s okay. More than any other event, having a baby is a time of coming together, and people love to share in it. They may not see the world like you do, but they are being generous, and you should be grateful and gracious in return. Because when it comes down to it, they’re just lovin’ on your baby in the way that they know how. And your baby deserves all the lovin’ it can get! I’ve been meaning to tell you, my friends have a vegan, eco-friendly cloth diaper detergent out. The website is here – http://rockingreensoap.com/ I use it for my regular laundry detergent, and it is super awesome. I’m interested in seeing how you do cloth diapers. Great article! I love this post, and it’s so perfectly timed! I am 25 weeks pregnant right now and started my very small Amazon registry when I was just around 12 weeks. I’m pleased to say that 90% of what we have so far is totally secondhand. My mother is an avid thrifter and seems to find more great items every week. For clothing it just makes sense, as he will outgrow it so so fast. For toys and decor, it makes it so much more unique (and like the rest of our home) to have thrifted pieces and not the same stuff everyone else has. awesome post! wish i had something like this to refer to a couple years ago when i was pregnant with my son. this should be a must-read for every newly pregnant woman. I have long been horrified at the consumerism connected with kids and babies in general. I don’t have any kids of my own, but lots of nieces and nephews, and here’s a tip for helping cut down on the “stuff” even when they aren’t your kids. For each niece or nephew, I set up a savings account in my name and their name when they were born. Each gift-giving event (birthdays, holidays, whatever) I make a deposit into that account with the money I would have spend on a gift. My oldest nephew is 12 now, and his account has about $1500 in it. It isn’t a ton, but I figure when he’s older he can use it for a trip abroad, a down payment on a car, or some purchase he really wants. Now that’s a lot better than a bunch of plastic toys he will have forgotten about by now! Wonderful post, I look forward to the rest of your essays in this series! 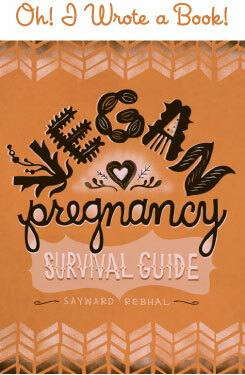 When I was pregnant with my daughter, my husband and I were living a very low-impact/sustainable/vegan lifestyle and had a wonderful support group where we lived, in Chicago (HUGE vegan community, oh how I miss them all!). I was the first of all my friends to start a family, and they were very enthusiastic to embrace our wishes and helped us seek out every vegan and sustainable avenue that Chicago had to offer. That was the easy part. Our families not only lived far away, but they were all having a hard time digesting how we wanted to raise our daughter (my husband is not vegan, so many of them didn’t think he would remain as supportive as he did-and still has!). Thankfully, we learned how to turn defensiveness into proactiveness, and by the time everyone flew in for my baby shower we were more or less on the same page. Thank you for keeping things so positive in this essay! What I constantly had to remind myself of when I was a new mother was that no matter how much I may not want certain gifts (what part of “no batteries, plastic or leather” do people not understand? I kept asking myself), the person who was giving them to our daughter was doing so out of love and celebration of this new little life that we were being blessed with. And frankly, they grow out of things so quickly that within the first few months things are being donated to thrift, and it is very easy to discreetly tuck in a couple of unwanted items here and there. Or even better, if things are brand new and still in their original packaging, they can be donated to daycare centers, shelters, etc. Oh, and for the record, my non-veg husband is still 100% supportive of raising our daughter veg and is her biggest advocate when it comes to dealing with disgruntled/inconvenienced family members! Can’t wait to read your post on vaccinations – it was something we struggled with and discussed ad nauseum, and eventually found a pediatrician who had developed his own selective/delayed vaccination schedule that we agreed with. We just found out that we’re pregnant and it’s really helpful for me to hear from a like-minded person who only reinforces all the things that have been on my mind lately. Sometimes going against the grain can be really difficult especially when other people don’t understand and offer little encouragement or help. I’d love to hear more about about cloth diapering and cloth wipes. I plan on using both after reading about how many diapers go into the landfills and how the baby wipes leech dioxin into the earth’s soil. Studies show that nearly every mother has dioxin, a known carcinogen, in her breast milk. It’s all very unsettling and motivation for me to do the right thing. But, I have to admit that it’s also very intimidating and seems like a lot of work. If you could just elaborate on how you manage, it would be muuuch appreciated! I also live in Portland and love to hear that such a free-thinking and rad lady such as yourself shares this lovely city with me. Often times I feel like a black sheep and people confirm that feeling with the looks they give me when I explain certain things like, oh I dunno, why I’m not spraying my front yard with toxic chemicals to kill a couple yellow flowers also know as Dandelions. The dominating culture is pure insanity! IMO. What can you do, I guess we’ll be making some donations! You are right though… I should be grateful to have such generosity! It really feels like we are prepared now for our new little family member! Great post, since my own baby is arriving soon the subject is very timely. I look forward to the rest of the series! I was thinking about the baby registry thing to head off some unwanted gifts, but was feeling a bit overwhelmed, so thanks for mentioning amazon, which I usually tend to avoid. I just checked the french site, and they also have the universal registry, which is the most appealing option. So far I’ve been able to score a ton of stuff second-hand from people in my entourage, and my mom is thrift store queen, so the impact has been minimal so far. But that may change once the baby is here, so the registry may come in handy after all. And the one thing that I think I really do want to buy new and ecological is the baby bed mattress. We were offered a bed, but I’m really not sure how healthy the well-used mattress is. Any thoughts on that? Carolyn – AWESOME AWESOME AWESOME idea. Such a no-brainer… I am writing it down. 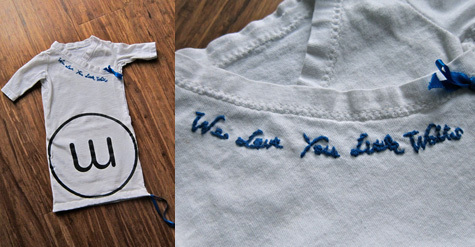 I think of things like this for our future kids, but for future nieces and nephews? Great idea! The universal wish list on Amazon is FANTASTIC and well-worth creating an account even if you don’t specifically register for anything actually ON Amazon. For those who haven’t used it – it basically allows anyone to go to Amazon, type if your email address and ta-da! There’s your wish list. I also use it just for everyday, household items before I forget, although I will definitely be using it when we decide to have kids. On another note, I hate to be a pain in the you know where, but I take slight offense to the notion that having a baby is “probably the most exciting time in your life”. What about those choosing to not (or unable to) have children? Although I would LOVE to have kids, I do not know if it is in the cards for me. Does that mean that I am missing out on one of the most important things in life? I should hope that I, and others, can lead an exciting, fulfilling life even without children. Sorry for the serious note, but reading that statement really stuck with me. Still love the site and all the wisdom! Sounds good. I wasn’t nearly as forward thinking as I am now when I was prego with my 2.5 year old but what I did realize then was all the stuff we “needed” was not. I am looking forward to reading up on your take on raising your son in a healthful, sustainable way. @ Laura – Hey, I think I’ve heard of that stuff. Thanks for the link! @ Alternative Housewife – I think I’ve said it before, but congrats on the pregnancy. You’re in Portland right? We’ve got some really great secondhand baby stores here. Great for maternity clothes too. ANd I’m with you on the hidden Christian messages. Sooo pervasive! Glad you like the article. More to come! @ Erin – Ooh! Good luck with trying to conceive! I’m loving all the family-oriented Bonzai readers. I had no idea there were so many! @ Carolyn – That is SUCH a good idea! I love it, and I’m totally going to use and spread the idea around. Thanks! A big article on cloth diapering is next up. Don’t worry – it’s not hard! Totally doable, totally worth it. I wouldn’t have it any other way! @ Julie – Aww, I totally remember that feeling when we started getting his things set up in preparation. Made it so much more real, like he was already living with us a little bit. About the clothes and care products, if the brands are sold by a big box store (like Babies R Us) you can almost certainly return them for store credit without a receipt.Even if the didn’t come from there originally, if you’re just making an exchange it’s all the same to the big corporation. They don’t care. So you may want to give it a try and see if you can’t get something you like! @ Diana – I very much understand your hesitancy about a secondhand mattress. Although our ‘crib’ came secondhand via a friend (Waits is actually third in the line), it’s a cosleeper and the ‘mattress’ is easy to clean I wasn’t worried about germs. If it had been a full-sized crib with a real mattress it may have been a different story. If you do decide to get something new, I know there are a lot of good eco options (organic, allergen free, sustainable, etc) out there. Luck! @ sarah – Well, it never hurts to plan ahead! Ha! @ Rebecca – I apologize if I offended you, but I do think you misunderstood me. Let me explain. This article was written for people who intend to have children. Considering the subject matter I figured that was a safe assumption. =) And for those that *choose* to have children, getting pregnant probably is ‘the most exciting event’ of their life to that point. Just like for those that choose to adopt, getting the acceptance letter and seeing their new baby for the first time is probably ‘the most exciting event’ of their life as well. Deciding to be a parent is a monumental, huge-mongous life changer, permanently. Its friggin’ exciting! And if you decide not to have children, any other number of amazing things may be the most exciting (excitement is hard to quantify). For me, that was graduating from college, and then later getting married, and then now having children. Of course, I do not believe that my husband’s life lacks some sort of inherent excitement because he never graduated from college, or that my good friend’s life is any less rich because she’s decided not to get married. Things are only exciting (in this way) if we have chosen them for ourselves. That’s why getting pregnant is probably the most exciting if you wanted to get pregnant. There’s a huge difference between speaking to a group of intentionally pregnant people and saying ‘this is probably the most exciting thing to happen to you’, versus addressing all of womankind and saying ‘getting pregnant would be the most exciting thing you could do’. I think the former is a fair assumption, and the latter is something I would never say. @ Kelly H. – Thanks for that, it’s great to hear from people who choose different paths..
@Rebecca: Way late comment, but I wanted to add something about the disposable vs. cloth. It’s kind of a long comment (sorry! ), but I researched it and talked about it a *ton* before my first son was born :) I always like talking about this because we’ve found cloth to be pretty simple and rewarding. The main problems listed with cloth use that I’ve found are the possibilities of too much stress on local sewage & water use. I don’t agree the sewage being problem b/c if your kid was pooping in the toilet, it’d go the same place. I’m personally on a septic system anyway. Disposible diaper poo is supposed to go in the toilet too, but do *you* know anyone that does that? I do agree that laundry is a major deal with water (we do a prerinse+*full* cold wash+*full* hot wash on our toddler’s diapers ever 3-4 days!). But, I would have to say that washing vs. manufacturing/shipping/selling of disposables seems to at least balance out with some studies saying manufacturing is worse. The ones that say manufacturing is better leave out factors like shipping/pulp & oil use (!) and are done by questionable sources (P&G). There are some links below. At least a few of the studies commonly cited in blogs and whatnot that talk about water problems with cloth are sponsored or directly done by Procter & Gamble… which owns, guess what?? @ Sarah – What great information, thank you!!! For me, it’s the chemicals on Baby’s skin that gross me out, even if the impact on the environment is the same. Just think of how uncomfortable a paper maxi pad is, and you don’t wear that every single day. @ J@ Alternative Housewife – I’ve come to the conclusion that ‘best diaper’ is different for everyone, because every babies body is differently shaped. I know some people love g-diapers, but for Waits they always leak. We are totally in love with Bum Genius. SOme people prefer prefolds with covers. I recommend getting a variety of secondhand options and seeing what works for your baby, then buying more of those. This is so amazing! Thank you for sharing your thoughts – some days all this prego marketing is so overwhelming that I feel like I just need to hide me and my impending sprout in a hole until they are 12. Of course then they will be bombarded with even more needless items but one baby step at a time! @ Sandra Moeggenberg – I totally understand. Good luck! Wow this game looks amazing. How is a guy supposed to get any work done with fatal distractions like this?!?! this is freaking me out as I want to be a SAH mum (therefore will be POOR) and I would like to DIY as much as possible – I have a sewing machine, limited skills, and an open mind. Help me please! any help or links much much much appreciated… or book suggestions, etc. @ Natasja – Oh congrats! Okay, I’m going to put this question to Twitter, hopefully I’ll be back with some answers . . . It now suddenly seems so much less scary… & we are moving home to live with my family in the NZ mountains which definitely helps calm my nerves!